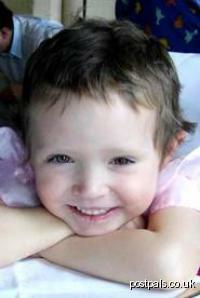 Abbie was diagnosed with Neuroblastoma, an aggressive childhood cancer, in December 2002 at the age of 21 months. The initial signs were positive with the cancer being localised. Sadly Abbie relapsed 6 months later and endured 8 months of gruelling treatment of chemotherapy, high dose chemotherapy and radiotherapy. She was pronounced in remission in early 2004 and enjoyed a year of good health before sadly a relapse was diagnosed. Once again, Abbie endured a range of treatments and was once again pronounced clear of the disease in February 2006. Sadly the success was short lived and a routine scan 3 months later showed that the disease was back stronger than ever. Abbie has an amazing spirit and is incredibly strong in her fight with this awful disease. By choice she would undergo morning out patient chemo before dashing back to school, anxious not to miss anything. Sadly the only option now is to try and keep the disease at bay with low dose oral chemotherapy but the benefits will only be short lived. The aggressiveness of the disease is such than she can appear better than she has been in months on one day and in the lowest of lowest lows with all the pain and discomfort this involves the next. A big thank you for the balloons, cards and presents for Jamie’s birthday and those who continue to write. Post Pals released some balloons in memory of Abbie. We have arranged Abbie’s funeral for Friday. Abbie has had a really rough fortnight. She was beginning to perk up and eat a bit more but then suddenly went very subdued, withdrawn and depressed. She has had an upset tummy and some very disturbed nights. We discovered yesterday that she has a very bad gum infection (which may or may not be caused by a tumour in her jaw) and is now on antibiotics. Today she is brighter and really enjoyed making a mirror which arrived from a wonderful Post Pal this morning. Thanks to everyone for cheering up both Abbie & Jamie – they love opening their post. People’s generosity is amazing.